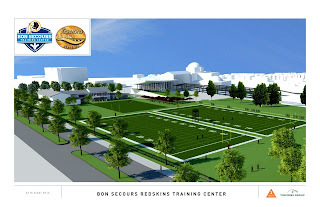 Mayor Dwight C. Jones today announced the city’s plan to develop the Leigh Street (Science Museum) site as the new home of Washington Redskins Summer Training Camp beginning in 2013. In making the announcement, the Mayor also disclosed that Bon Secours Richmond Health System (BSRHS) and the City have formulated a comprehensive strategy to stimulate new economic development and jobs throughout the city. 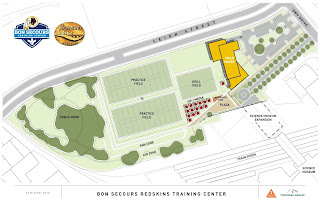 · BSRHS participation will enable the construction of the Redskins practice fields and sports medicine facility at Leigh Street (investment of almost $6.4 million over 10 years). · BSRHS will develop a medicine and related use property at the former Westhampton School property site as well as maintain the adjacent football field. · BSRHS will develop a medical wellness and fitness center and related use property in the East End adjacent to the Bon Secours Richmond Community Hospital site. 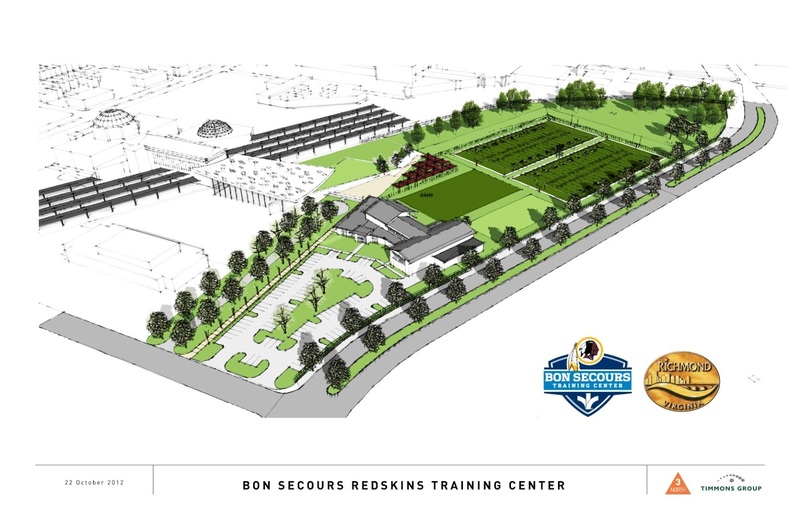 “This agreement, in partnership with Bon Secours and the EDA, places the city in a position to not only build the practice fields and field house for the Redskins, but to generate investment and business expansion throughout the city,” said Mayor Jones. The City will provide BSRHS with a long-term lease for use of the Westhampton School property site. The associated value of being able to develop on that site, without outright buying that site at market value, is being directed to the construction costs of the Washington Redskins practice fields and the development of Richmond Community Hospital in the East End. According to Bon Secours, the Westhampton development is expected to generate 120 new jobs with a minimum payroll of $10 million annually while the East End development is expected to generate 75 new jobs and a minimum annual payroll of $5.7 million. With the addition of the Leigh Street development, the Bon Secours partnership will help the city of Richmond realize the creation of over 200 new jobs. Bruce Allen, Executive Vice President and General Manager of The Washington Redskins stated, "The Washington Redskins and our fans are excited about the team's summer training camp move to Richmond. We are grateful for the leadership shown by Governor McDonnell, along with Mayor Jones and his relocation steering committee, and want to thank them and Bon Secours Health System for their commitment to building a world-class training facility. We believe our Richmond training camp experience will become the model for all professional sports teams." The economic impact of the three week summer training camp alone is estimated to be $8.5 million per year. Development at Leigh Street will also stimulate retail activity in the Fan, Carytown and the Boulevard area and supports the city’s commercial corridor revitalization plans. The City of Richmond will make a short-term bridge loan to the Economic Development Administration to accomplish the overall Leigh Street transaction. The loan will be paid back to the City through rent and sponsorship dollars that will be collected by the EDA. The EDA will act as the official agent for the Leigh Street site and will lease the facility to the BSRHS for its use, other than during the six-week period when the facility will be for the sole use of the Washington Redskins. Specifics of the performance agreement and transaction terms are still being finalized. A resolution will be introduced to Richmond City Council tonight expressing the Administration’s and City Council’s support for this development package and the formal papers that will follow. Please click here to view the Washington Redskins Study. Please click here to view the Economic Impact of the Redskin Training Camp in the City of Richmond powerpoint. The Cruise Ship “Yorktown”, which travels along the East Coast, is preparing to anchor at the River City’s Intermediate Terminal on Wharf Street on October 26 and November 1. The Yorktown is a U.S. Flag vessel and the trip marks the first time the ship’s passengers will disembark in Richmond. They will spend each day visiting historical sites in the City before boarding the ship for the next port of call. New York based Travel Dynamics International cruise line offers the weeklong cruises. The ship starts its voyage in Alexandria with its last call in Philadelphia. The Yorktown is 256 feet long, 45 feet wide, with a draft of 9 feet. It can carry 140 passengers and has a crew of 40. To prepare the Intermediate Terminal for the vessel’s arrival, the Department of Public Works and the Department of Economic and Community Development provided $13,000 for improvements, which included the addition of two mooring cleats and the installation of six dock bumpers. A new draft survey of the dock turning basin also was performed. Additional dock improvements will be made at a later date. For information on City of Richmond services, log onto www.RichmondGov.com.